Umatilla junior Austin Bieren goes to the freethrow line with three seconds to play and the score tied at 56. Second frame shows senior teammate Nathan Creason giving Bieren a word of encouragement. The last three frames shows the shot that won the game. UMATILLA - "Timing is everything," goes the old axiom. 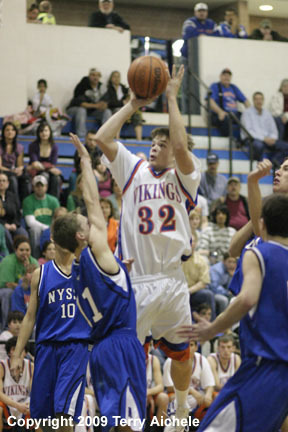 The Umatilla Vikings proved that on Friday night when they defeated Nyssa by a freethrow on Friday, January 30, 2009. The game was a close one the whole evening with Nyssa leading at the end of the first period, halftime, and end of the third period. It all came down to Umatilla ball control in the last two minutes of the game and junior Austin Bieren hitting a freethrow with three seconds to go in the game. Both teams started the first period with a fast paced uptempo style of game. The lead seesawed back and fourth throughout the first period. Umatilla led by as much as six points with three minutes to go. 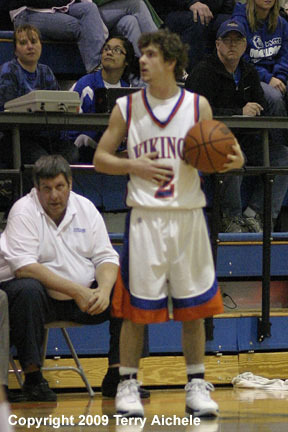 The Vikings had three players hit treys in the first - Levi Russell, Nathan Creason and Steve Williams. Then the Vikings hit a slump, stuck at 17 while Nyssa scored nine to take the 20-17 lead. Umatilla had a slight height advantage but that didn't seem to intimidate Nyssa over the course of the game. Umatilla was stuck at 17 for the first two minutes of the second period. Vikings scoring in the second period included Fransisco Campos, Kasey Pankey, Levi Russell, and Ruben Vavarrete. 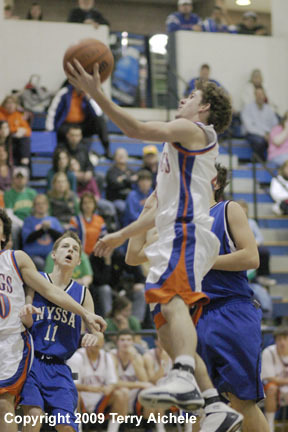 Scorers for Nyssa included Conner Fiscarelli and Seth Glenn. Nyssa led at the half 33 to 27. Umatilla outscored Nyssa 17 to 12 in the third period. Scorers for Umatilla included Navarrete, Creason, and Williams. Scoring for the Bulldogs included Jeremiah Leos, Seth Glenn, and Javier Trinidad. The Vikings closed in on the Bulldogs at 5:27 being a point down 36 to 37. Then the Vikings tied it up 40 all at 2:49. Then Umatilla went ahead on a shot by Williams to take a 42-40 lead, their first lead since the middle of the first period. Nyssa came back with a jumper and a freethrow to be a point down, 43 to 44. Then the Bulldogs hit a shot at the very end of the third period to take a 45-44 lead. The teams exchanged the lead throughout the fourth period. Umatilla led 56 to 55 when Jeremiah Leos of Nyssa hit a freethrow to tie it up at 56. At 1:50 to go Tony Villanueva called time out set up the plan for the Vikings to go into ball control mode. For about one minute and forty seconds the Vikings slowed it down and controlled the ball. Then Umatilla called another time out setting up the plan for a final shot. The Vikings inbounded the ball with eleven seconds to play. Junior Austin Bieren was fouled with just three seconds to play while setting up for a shot. Beiren hit the first and big roar went up from the Umatilla fans at the Vikings took the 57 to 56 lead. Beiren missed the second shot but there wasn't enough time for Nyssa go the length of the court and score. Another cheer went up as the team, coaches and cheerleaders gathered in the middle of the court. 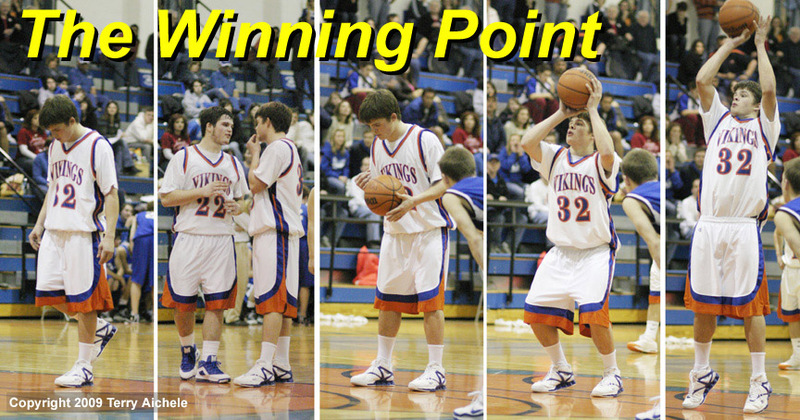 Beiren was hoisted up onto his teammates shoulders as the group assembled at center court sang the Vikings fight song. There were a lot smiles lighting up The Pit as the Vikings made their way back to their dressing room. 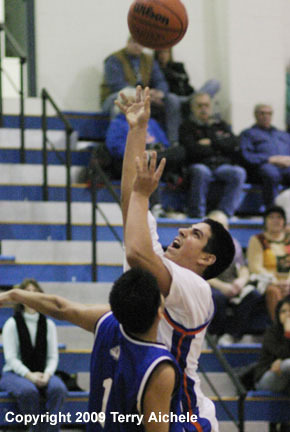 LEFT - Austin Bieren of Umatilla shoots a jump shot. RIGHT - Viking Fransisco Campos takes a shot while being closely guarded by Javier Trinidad. 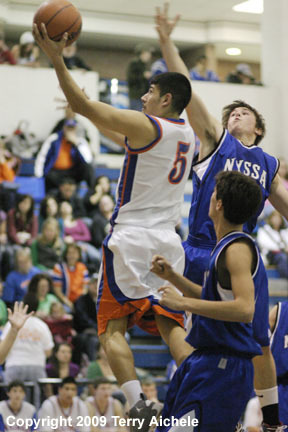 LEFT - Ruben Navarrete of Umatilla glides to the basket going past two Nyssa defenders. 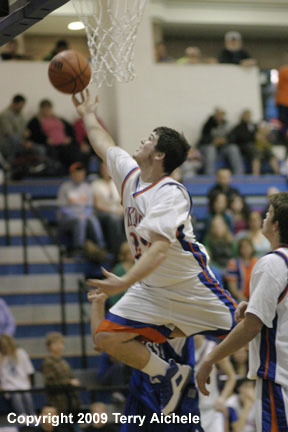 RIGHT - Nathan Creason of Umatilla on a layup. LEFT - Taylor Pankey of Umatilla drives to the basket. 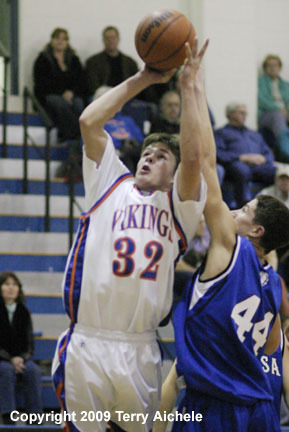 RIGHT - Viking junior Austin Bieren takes a jump shot while being closely guarded by Carter Spear of Nyssa. 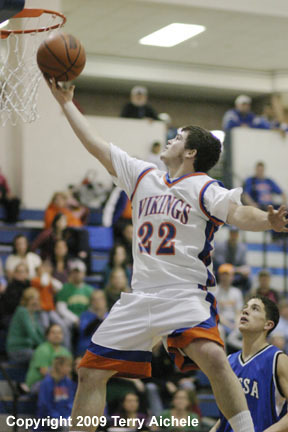 LEFT - Nathan Creason of Umatilla spins and lays a shot up on the glass during the game on Friday night. RIGHT - Viking Steve Williams watches the seconds tick of the scoreboard clock during the last minute of the game.